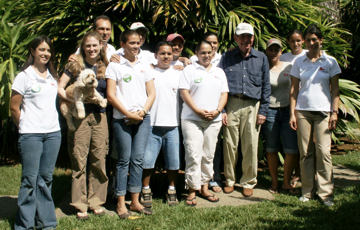 "Part of Bosque del Cabo staff with Costa Rican president, Oscar Arias, when he came to Bosque del Cabo for a press conference on preserving the biodiversity of the Osa Peninsula"
Our staff members are a very important part of Bosque del Cabo. The staff acts as a bridge between the guests and the lodge- they help the guests with important practical tasks like ordering food and setting up activities, but they are also there to introduce our guests to this wonderful country and the lovely people that make Costa Rica so enjoyable. We try to choose staff members who are courteous and helpful. Most of our staff will speak some English, and all of them are interested in learning more English. The staff is usually happy to help guests learn and practice a little Spanish, also. Most of the staff are locals and will happily tell you more about Puerto Jimenez and the surrounding areas. We have included here some of the short, self-written biographies of our staff. Leonardo is in charge of the office in Puerto Jimenez. He was born in San Jose, Costa Rica in 1972. He attended Bilingual Schools from his childhood throughout his school years. After many years visiting the Osa Peninsula he found a Job in our Office in Puerto Jimenez in 2000. According to Leonardo, he found a perfect place to plant his seeds in the Osa Peninsula. His family now includes four beautiful kids, Marlon, Maria Fernanda, Maria Jose, and Maria Marina. Leonardo wants to spend the rest of his life here in Osa. He loves the animals, plants, birds and the forest. Some of his hobbies include: playing soccer, basketball, fishing and softball, as well as relaxing in hammocks and bird watching. Jose works in the office in Puerto Jimenez. He was born on August 13, 1982 in Puerto Jimenez, Costa Rica. He lives in an apartment in Puerto Jimenez. He completed the last year of his secondary school and he will go to University next year. Jose has worked for various businesses and lodges in the Osa Peninsula. He is very happy working in the office in Puerto Jimenez. In his free time Jose enjoys spending time with his family and friends, riding mountain bikes, watching TV (playing video games with his nephew) and dancing. Karen works in the Bosque office in Puerto Jimenez. She was born on April 28, 1989 in San Jose, Costa Rica. She moved from San Jose two years ago (2006) to work with Bosque, this is her first job. She has two sisters (ages 13 & 23) and a brother (age 6). Her whole family, including her parents, lives in San Jose. Karen is involved in community work, and she served as Treasurer for Women of the Osa for this past year. In her free time Karen likes to visit her family and friends in San Jose. She loves the Osa Peninsula and says that it is one of the most beautiful places in Costa Rica. Philip is the resident biologist at Bosque del Cabo. 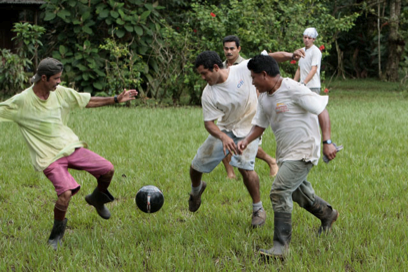 He has been visiting Costa Rica from the early ninties and has been guiding at the lodge since April 2001. Originally from the U.K., Philip graduated from the University of Portsmouth in 1979 with a degree in Zoology/Geology. He has three years research experience in some of England’s ancient oak woodlands. He lived in Norway for three years, engaged in forestry work. His current research here is the population dynamics of butterflies and amphibians, both being important indicators of environmental health. In December 2005 Philip was made a research fellow for the Friends of the Osa. Philip is a qualified teacher and taught biology in the U.K. He is also a qualified guide and has guided not only in the natural world, but also in such diverse locations as Britain’s historic houses, castles, and art galleries. Philip has a life long interest in all natural sciences. He specializes in tropical ecology and has a wide ranging knowledge of the local flora and fauna along with their complex interactions. Over recent years, Philip has edited two books on Costa Rican natural history. He is currently writing his own book about the ecology of a Tropical Rainforest. Gerly is the Hostess and Guest Relations person at Bosque del Cabo. She was born on September 23, 1980 in Guanacaste, Costa Rica. She attended a bilingual high school for 3 years; then started working in 1997 in tourism. Her first job was working in a hotel (in the area where she grew up) handling various departments in the hotel, including activities director, popular and traditional dance teacher, guest relations (hostess), and water aerobics instructor. She had this job for 6 years; afterwards she started training people in hotel work. She lives at Bosque del Cabo with her beautiful baby girl, Jimena (born in August 2008). Gerly enjoys socializing with people, as well as traveling. She appreciates and thanks Phil & Kim for the opportunity that she has to work at Bosque del Cabo. She loves to dance as well as sing. Every once in a while, she will teach a dance class for the guests – she encourages everyone to come and have fun! She also really enjoys nature and spending time outdoors. Gerly really enjoys people and is looking forward to greeting each guest and getting to know them better. Carlos is one of the Reception and Guest Relations people at Bosque del Cabo. Carlos is also one of our naturalists at Bosque. He was born on May 5, 1977 in Puerto Jimenez. He is married and has one son. Carlos loves nature and guiding tours in order to show people the wonders of the rainforest. He especially loves guiding tours of the Rio Esquinas and Corcovado. He says it is his great pleasure to show visitors to his country some of the most beautiful and pristine natural areas of Costa Rica. On his off time he likes to play soccer! Cindy is part of the Front Desk Reception staff at Bosque del Cabo. She was born on February 20, 1981. She studied Informatic Engineering in the Central University in San Jose. At age 22 she traveled to Canada and worked there for 4 years. She was able to meet a lot of people from around the world while in Canada and thought it was a really nice experience. In October 2007 she started working at Bosque and she is really enjoying getting to know the area and all of the staff. She is very grateful to Kim and Phil for letting her be a part of the family at Bosque del Cabo. If there is anything that she can do for you as a guest here, please let her know and she will gladly help. Roger is one of the cooks at Bosque. He was born in Perez Zeledon, Costa Rica on February 27, 1959. When he was young he worked with his father in the fields. At age 22 he was married. In 1980 he began working at the Wilson Botanical Gardens (located here in Costa Rica). It was through this job that he learned all about plants and botanical work, which sparked his love for gardening. It was also here that Roger began to learn to cook. Robert Wilson taught him the basics of a kitchen. Following this job he started taking educational courses with INA and other private schools. During this time he kept cooking and his interest in cooking continued to grow. Roger started working at Bosque del Cabo in December 2003. He loves being here and calls Bosque the Paradise of the Osa Peninsula. He is enchanted by the nature in this area and says that he has spent some of the best moments that he can remember watching squirrel monkeys (his favorite animal). Roger likes to spend his free time with his family. He also loves to fish (his favorite sport). He hopes that the guests enjoy his food. Daniel is one of our cooks. He was born on November 25, 1985 in Golfito. He has lived in different parts of southern Costa Rica, but he moved to Puerto Jimenez three years ago when he started working at Bosque del Cabo. Here he has discovered a natural talent and passion that he has for cooking. He started working as a dishwasher, and later he became a cook’s assistant, and now he will regularly handle lunches and breakfasts on his own and is the Sous Chef. 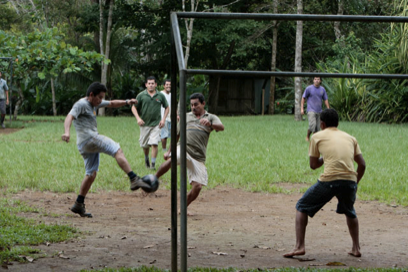 He likes to play soccer, visit his family in Los Mogos, and go out in Puerto Jimenez on his motorcycle with his friends. He dreams about someday being about to study to become a professional chef. He really appreciates Phil and Kim for the great opportunity that they have given him and loves his job at Bosque. Maureen is a chef. She loves to cook and loves to surf. Mo has been in and out of the kitchen at Bosque del Cabo for 14 years. Originally from New York she has traveled/cooked in Europe, Asia, and North America. She is enthralled with this life and this place- and she says she knows how lucky she is. Kevin is our Driver, and a general Jack-of–All-Trades that works around Bosque in many capacities. He was born in San Jose, Costa Rica on October 16, 1979. When Kevin was 2 years old his father died, and then when he was 12 years old his mother also passed away. He was raised by his older sister who lived in this area. Almost immediately he had to start to work to help support himself and the family. He has worked many different jobs and has lots of skills, including truck driver (large trucks), construction (all phases), roof thatching in the tradition style, taxi driver, and so on. He has found a nice home here working at Bosque del Cabo and gets to use many of his different talents. Kevin says he really enjoys life. He likes to surf, play soccer, and dance. He loves meeting new guests and practicing his English. Trino (his nickname) is a Driver at Bosque (he drives both the guests and our truck that goes to San Jose for supplies); everyone calls him “Trino” (because he looks so much like his father, who has the name Trino). He was born in Puerto Jimenez, Costa Rica. His family orginially comes from Panama and was one of the founding families of Puerto Jimenez. He went to primary school in Puerto Jimenez and then to high school in Palma Norte, where he got a degree in agricultural science. He looks forward to getting to know the guests and speaking to them in his great English! Jutta was born in Germany, near frankfurt. She learned massage therapy when she was 16 years old; Then when she was 18, she went to school for massage therapy. She has been a practicing massage therapist for 30 years. Destiny brought her to Bosque del Cabo and she looks forward to giving you a massage. Jutta is also a mother; she has three beautiful children- Simon, Elias, and Rebecca. Greivin is an assistant bartender and one of the baggage porters at the lodge (where he has worked for more than a year). He was born in Ciudad Nelly on March 5, 1986, was raised and went to school in the town of Los Mogos (up at the top of the Golfo Dulce). He then went to work at his father’s small grocery store; he also worked at a sawmill. He has one SISTER; another sister died 7 years ago. Greivin is married and has a 3 year old son. His hobbies are playing soccer and fishing. Greivin is enthusiastic about his work and is ready to get to know more guests and keep practicing his English. Heylin is one of our waitresses at Bosque. She was born in Golfito, Costa Rica and has lived in Puerto Jimenez with her family (mother and brother) for her entire life. She did her schooling in Puerto Jimenez and she hopes to go to University to study nursing. On her days off Heylin likes to go to the beach, and her favorite food is pasta the way that they make it at Bosque del Cabo. Heylin loves working at Bosque del Cabo and greeting all the wonderful guests. She especially likes it when we have return guests that have become like friends to her. 2008 was a great year for Heylin, she had gave birth to a son, Evans, on October 26! She will enjoy time with him until she returns from maternity leave in February 2009. Rolando is one of our waiters at Bosque. He was born in Puerto Jimenez, Costa Rica on December 16, 1988. He finished his primary and secondary studies in Puerto Jimenez. He hopes one day to study administration and to start his own business. He appreciates the opportunity to work at Bosque del Cabo, and to learn first-hand about customer service and tourism. Rolando started working at Bosque as a kitchen helper, but did so well in that job that he was promoted to the job of waiter. He feels so lucky to have been born in a peaceful country. In his free time Rolando likes to play soccer, surf and practice riding his skimboard. Rolando is a friendly guy, and loves to work at Bosque and to interact with the guests and try to give them his best service. He says he feels like the staff at Bosque is a big family (and with good reason- his mother works here as one of the cabina maids and his sister works for a staff member of Bosque, acting as a daytime nanny for her child). Pat is interning during the peak season of 2008-2009 at Bosque del Cabo. He recently received his Bachelors degree in Marketing from Western Washington University in Bellingham, WA. Pat works as a tour director in Alaska during the summertime and is STOKED to be spending the offseason in Central America. During his time at Bosque, Pat plans to develop a greater understanding of the sustainable tourism industry and soak up as much knowledge on the subject as possible. Pat is quite comfortable behind a bar, so chances are good that you will find him there. If not, you may find him brushing up on his Spanish, playing fútbol with his co-workers, or hiking the beautiful trails and coastline of Bosque with his camera in hand! PURA VIDA! He would like to extend a big thanks to Phil and Kim for giving him the opportunity to call Bosque home. Mandy is interning at Bosque del Cabo. She was born in Janesville, WI and graduated from the University of Wisconsin-Madison in 2004 with a degree in Real Estate and Urban Land Economics and Risk Management and Insurance. Mandy currently resides in San Francisco, CA and is taking a gap year to explore her interests in hospitality, sustainability and the Spanish language. Mandy enjoys any outdoor activity from hiking to kayaking to sand volleyball. Mandy is excited at the opportunity to live and work in Costa Rica. Adrienne is an intern at Bosque del Cabo. She comes to us from chilly Calgary, Alberta, a long ways from here, where she is a third year university student studying biochemistry. She grew up in Calgary and has lived there all her life, where she works at a bar/restaurant as well as a part time accountant for a small oil company. She loves traveling with her family, and has been many places in the world, but has found a soft spot for Central America, and Costa Rica in particular. She has spent many months in the past two years in this tiny country. An avid practitioner of yoga and a vegetarian, she believes in living close to, and in harmony with nature, something she’ll be sure to do at Bosque. She is excited about and looking forward to immersing herself in a Latin American culture once again, and is thankful to Bosque for the opportunity.